Non-catalytic component of the 20S PRMT5-containing methyltransferase complex, which modifies specific arginines to dimethylarginines in several spliceosomal Sm proteins and histones. This modification targets Sm proteins to the survival of motor neurons (SMN) complex for assembly into small nuclear ribonucleoprotein core particles. Might play a role in transcription regulation. The 20S PRMT5-containing methyltransferase complex also methylates the Piwi proteins (PIWIL1, PIWIL2 and PIWIL4), methylation of Piwi proteins being required for the interaction with Tudor domain-containing proteins and subsequent localization to the meiotic nuage. 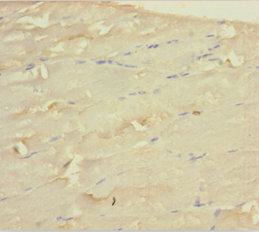 WDR77 Polyclonal Antibody. Unconjugated. Raised in: Rabbit.